Stitch multiple PDF pages into one page. Be easy to arrange PDF pages in new page. Support Mac OS X and Windows OS. VeryPDF PDF Stitcher Command Line is a command line application that can stitch PDF pages into one page on both Windows and Mac OS X system. It also allows users to set the sequence, amount, layout, size, rotation, gap space, draw lines, margins, etc. of pages in the new PDF page. What's more, it supports to customize rows and columns of original PDF pages in the stitched PDF page. VeryPDF PDF Stitcher Command Line provides Windows and Mac versions. The usage and options of the two versions are the same and both of them can sew multiple PDF pages to one PDF page. In the following contents, you will see the usage and options of this command line application. 1. Download Windows version of VeryPDF PDF Stitcher Command Line Then, please double click the setup file and follow the setup wizard to install it on the computer. In the installed folder, you can see an executable file named pdfstitch.exe which is the called program in the MS-DOS command prompt window. 2. Open MS-DOS command prompt window in which you can input command line. To help you better understand the above command line template, some examples are shown below. If you want to stitch even or odd PDF pages together, you can use the following two options: -even and –odd. The first example is to stitch only even PDF pages together into a new PDF, while the second example is to stitch only odd PDF pages together into a new PDF. If you need to resize margins of original PDF pages in new stitched page, you can use the following options: -t <int unit>, -l <int unit>, -r <int unit>, and -b <int unit>. This example is to set top margin, bottom margin, left side margin and right side margin as 10 mm respectively for the new stitched page. If you want to rescale the original PDF pages, you can use the following two options: -gx <int unit> and -gy <int unit>. This example is to rescale the width of each vertical gutter as 50 mm and the height of each horizontal gutter as 50 mm. You can also adjust the PDF pages in vertical or horizontal direction by using the following options: -order <string>, H, V, HR, and VR. This example is to adjust the PDF pages in vertical direction. Please check more options and usage of VeryPDF PDF Stitcher Command Line by calling the executable file in MS-DOS command prompt window and press Enter. If you want to get full version of this command line application, you can buy VeryPDF PDF Stitcher Command Line here. 1. 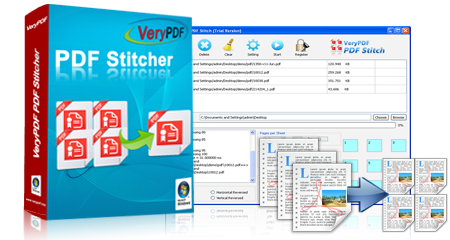 Download Mac version of VeryPDF PDF Stitcher Command Line and install it on your Mac OS X system. Then, you need to open a terminal window in the Mac OS X so that you can run the program. -plan <string> <path> : Use a plan file instead of other options. <string> refers to the plan file type: "lua" or "legacy".<path> refers to the path of the selected plan file. Please do not use other options when used this option. -pr <int,int,...> : Select the page range, e.g., 1,3,5-10. Or you can use -even or -odd. -even : Select only the even pages. -odd : Select only the odd pages. -per <int*int> : Set pages per sheet, e.g., 2*4 refers to put 8 pages per sheet: 2 pages a row and 4 pages a column. -addline <int,int,int> : Add lines. <int,int,int> refer to the RGB values. 0<int<255. -order <string> : Specify the page order on each sheet. -gx <int unit> : Specify the width of each vertical gutter.Unit is in, mm, or pt. -gy <int unit> : Specify the height of each horizontal gutter.Unit is in, mm, or pt. -t <int unit> : Define the top margin for each output sheet. Unit is in, mm, or pt. -l <int unit> : Define the left side margin for each output sheet. Unit is in, mm, or pt. -r <int unit> : Define the right side margin for each output sheet. Unit is in, mm, or pt. -b <int unit> : Define the bottom margin for each output sheet. Unit is in, mm, or pt. -size <string> : Specify the sheet size. For instance, A3, A4, B3, and letter. Cannot be used with -scale. -scale <int> : Enlarge or shrink sheets by an exact percentage, e.g., -scale 100 is to retain the original size. -$ <regcode> : Register the application. Split one PDF document to multiple ones and merge multiple PDF files to a single one. Users can also use it to extract and remove pages from PDF documents. Edit PDF content, hyperlinks, annotate PDF and fill PDF form. It can also create PDF from images, or any printable files with the help of PDFcamp Printer.